The 16-year-old environmental activist Xiuhtezcatl Tonatiuh Martinez is no stranger to Inhabitat. Known for suing the government for inaction on climate change and calling for an end to fossil fuel use, Martinez just received important international recognition for his tireless work. Last week in Sweden, he accepted the new Children’s Climate Prize, which comes with a generous financial reward. Swedish renewable energy company Telge Energi awarded Martinez the prize, which is given to a kid between 10 and 16 who is working to help the environment. Telge Energi described Martinez as an “extraordinarily powerful voice in the climate debate worldwide.” The jury who chose Martinez praised his willingness to take on big interests such as the fossil fuel industry, and commended him for inspiring others to use their voices too, no matter their age. For winning the prize, Martinez received 50,000 Swedish Krona, which is about $6,000, along with a medal. The award ceremony occurred in Sweden last week, commemorating the Children’s Climate Conference that took place last year just before COP21. Martinez has made his voice heard through avenues as diverse as legal action to hip hop, and he’s the director of Earth Guardians, a youth organization comprised of musicians and artists who want the world to be a better place. Congratulations and thanks, Mr. Martinez! I am thrilled to see that young people are speaking out and making real progress. It is your future, and nobody can make the case for action to curtail GHG emissions more persuasively than you can. Keep up the good work! 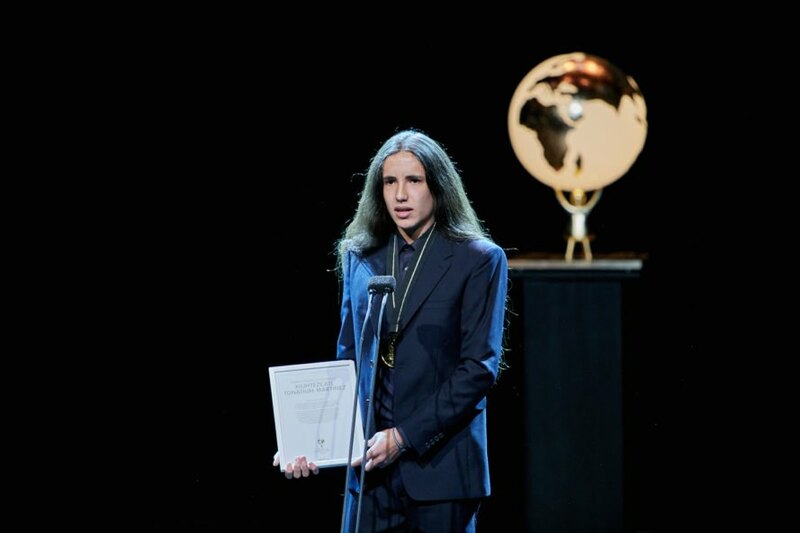 16-year-old environmentalist Xiuhtezcatl Martinez won the 2016 Children's Climate Prize. The Children's Climate Prize is awarded by Swedish renewable energy company Telge Energi. The award goes to a kid between 10 and 16 who has worked to help the environment.